I love me some superfoods! ☺️ Here is a quick recipe that I have been loving lately! • top with hemp & cinnamon as desired! Did you know that cinnamon is considered a superfood? Not only does it contain fiber, calcium, iron and zinc it can help regulate blood sugar! Cinnamon can also stimulate brain activity by just the smell 👃🏼 and has anti-inflammatory properties. GO CINNAMON GO! Valentine's Day the Health Minded Way! You can always do what me and my guy did last year and adopt a kitty cat. Most shelters/ humane society does low cost/free adoptions this weekend to make room for new animals. Find the closest humane society to you here. First weekend of 2016 brings so much opportunity! I felt so great this weekend flipping open to the not only a new month in my planner but a whole new year. Fresh start where you need it and a continuation of all the greatness you built in 2015! To make your year a huge success write down what you want to make happen. Make a Pinterest board or be old school and cut out scraps form magazines to hang them in a spot you glance everyday. Here is an example of my first round of visioning this year! I plan to add as I go! Post your visions and tag me @whithelena ! Food Preparation Fun! Setting yourself up for success. I am sure you have heard about food prep or meal prep to set yourself up for healthy meal success throughout the week. If not, thats okay too, you are in the right place! 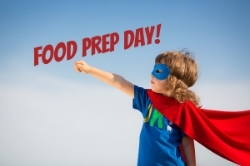 Food prep can be any time you dedicate to preparing more than one meal for yourself/family. This not only cuts down on time spent in the kitchen throughout the week but sets you up for success with staying on track with your eating plan and can even save you money. WAHOO. I try to do this towards the beginning of the week and again mid week but since everyone's schedule is different, you can pick the best time for your routine. Before we meal prep, we need to go back to the beginning... the grocery shopping. Make a list and check it twice! (serious about the checking twice, I once forgot tomatoes when making tomato sauce) If you are a routine eater like me, your list typically stays the same week to week with a few changes here and there depending on the season. I hope this sparked some ideas for you to get into a food prep mindset. I would love your favorite recipes or items to make ahead of time! Be part of the Hydration Nation! August always seems like the hottest month no matter where you live! Hydration is key to feeling your best, but sometimes water can get a little borrrrinnggg. Snazz up your water by adding fruit, herbs or just a splash of lemon juice for a little added zing! Whats your favorite H20 enhancer? Here are a few of my favorites from my gal pal Dani on her youtube channel! Happy Monday friends! Just remember to keep breathing in possibility and getting rid of the unwanted self-doubt <3 You got this! Listen up gang, your skin is the most expensive coat you own, so you better treat it right. With beauty and cosmetics being a BILLION dollar industry there is so much CRAP out there with "natural" ingredients with companies trying to be something they are not. I thought I would share my faves to protect and your most absorbent organ from chemicals and toxic ingredients. Kiss My Face is such a GREAT brand with lines of face, body, lip balm and even oral care but I am a big fan of their Suncare line. Living in Southern California I wear SPF 30 on my face every day. I highly recommend even if you don't live in a particularly sunny area to do the same as the sun is always shining even behind those clouds. I know what you are thinking, "Whitney but I really want my face to be sun kissed all the time" (hint: use a bronzer; I love me some bare minerals!) Let me tell you wrinkles and sun damaged skin is never going to be trending. Take care of that cute face you have and protect those pores : ) Slap on some SPF 30 with no parabens, no artificial fragrances, gluten free ingredients, no phthalates and not tested on animals! You can read all about their ingredients here. I have always LOVED washing my face (strange I know) but growing up my mom worked for Clinique and I got the hook up with all their skin care products. I still do use some Clinique products and we will get to that but right now its all about the Juice baby!! Juice Beauty is an organic line of skin care/make up/hair care and it is absolutely lovely on the skin and scalp. A few years ago I bought the Blemish Clearing Solutions Kit and I was HOOKED. It comes with a cleanser, peel, clearing serum and moisturizer. Currently I use the cleanser every day and the peel every so often. These products are wonderful because they clean my skin and I feel safe using them! Read all about their ingredients here. Enough about the pretty face! EO Body lotion and shower gel is where its at for the rest of those sensitive skin cells. They come in a huge container and reasonable priced for how much good stuff there is (and isn't) HUGE fan of the coconut/lemon or citrus/mint combination. This brand is NonGMO Project Verified, gluten free, certified B corp and uses essential oils, aloe, chamomile. Now for the fun part... Share YOUR faves with me!! I love trying new products and supporting companies with a responsible mission! I get it! You are BUSY. Healthy snacking should not be something you compromise for your busy lifestyle. Below is a list of snacks with little to no prep and BAM. Clean snacking is yours. You can also spend half hour on the weekend or your day off to prep snacks for the week, setting a truly no excuse plan in place! 6. Bell Peppers - Is it weird I eat a whole bell pepper at a time? You can slice them and eat with hummus if you want! 9. Popcorn - Make a big batch and put into single serving bags for the week! 10. Cherry Tomatoes! I like to eat the small ones just by themselves! Bonus snack- lettuce wraps. Wrap lettuce, slice of turkey/ham/cheese and voila. You can get extra crafty if you put some pesto or hummus. Add your favorite on the go snacks below! Love With Food and a Giveaway!! I have a TREAT for you. My pal KC from GFree Foodie sent me a Love With Food box to review and one to GIVEAWAY! The giveaway box will be different from the one I received as they change every month, but I can promise you, it will be full of yummy artisanal snacks. Love with Food is a wonderful company not just because they send you yummy snacks every month but they also donate a meal for every box that is sold! They donate to several food banks such as the Feed America Network and Share our Strength- No Kid Hungry. They have already donated 694,918 meals because of the awesome Love With Food Community. Now the fun part, enter to win! Comment below on this post (of what I said in the video) and I will pick a winner July 18th at Noon PST. Only US residents are eligible to win. Wanted to share my thoughts in video format! Share your helpful tips on confidence below. Is that red lipstick, your "power tie" or maybe just s big smile. What gives you the confidence you need? Organic Effect - What are we really eating? I saw this video circulating around social media the last few days and had to re-share here. I am a big fan of eating organic as much as possible, especially the "dirty dozen". I can totally relate to all organic not being in my budget, so that may mean I go without that fruit or vegetable that week. It only takes two weeks for your body to start recognizing the change! This solidified my reasons and how even though we can wash our fruits and vegetables we are consuming large amounts of pesticides in our day to day routine. How vigilant are you when it comes to buying organic? After watching this video will you be more inclined to leave the conventional in the produce sections? When it comes to baking, I don't do so well from scratch. Thats why I love easy to follow recipes and brands that make it super easy for me. I always look for the NonGMO Project Verified or USDA Organic logo when shopping in packaged foods. I had a hankering for something sweet today and made some brownies using Namaste Foods Brownie Mix. Not only is the Dark Chocolate Brownie Mix delicious it is also organic, gluten free and free of the top eight allergens. I don't have any serious food allergies so I added some nuts to the top! I had some leftover hazelnut meal from making Hazelnut milk and hate seeing food go to waste. Hey guys! I am so excited to share this video with you. I joined GFree Foodie in the kitchen and made some Hazelnut Milk! Enjoy!